GASOLINE / Combined internal combustion engine with a carriage: patent no: 549,160 (1895). Never manufactured — Selden collected royalties. GASOLINE / First successful gas-powered car: 4hp, two-stroke motor. The Duryea brothers set up the first American car manufacturing company. 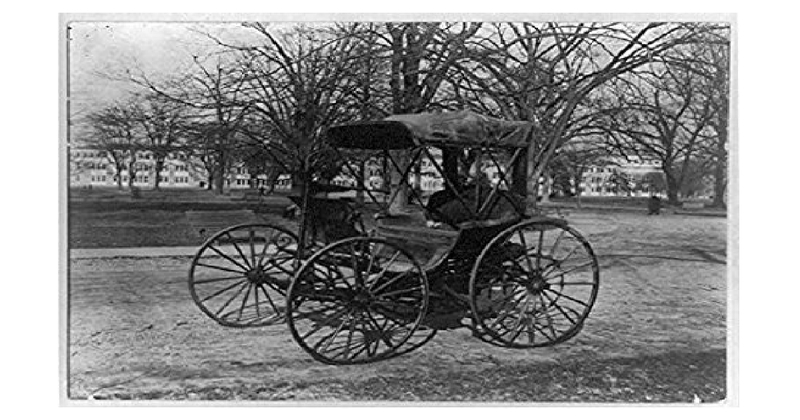 Horseless buggy made by Charles and Frank Duryea, 1893. The first practical gasoline automobile built in the United States. Bicycle mechanics J. Frank and Charles Duryea of Springfield, Massachusetts, had designed the first successful American gasoline automobile in 1893, then won the first American car race in 1895, and went on to make the first sale of an American-made gasoline car the next year. Thirty American manufacturers produced 2,500 motor vehicles in 1899, and some 485 companies entered the business in the next decade. In 1908 Henry Ford introduced the Model T and William Durant founded General Motors. The new firms operated in an unprecedented seller’s market for an expensive consumer goods item. With its vast land area and a hinterland of scattered and isolated settlements, the United States had a far greater need for automotive transportation than the nations of Europe. Great demand was ensured, too, by a significantly higher per capita income and more equitable income distribution than European countries. Given the American manufacturing tradition, it was also inevitable that cars would be produced in larger volume at lower prices than in Europe. The absence of tariff barriers between the states encouraged sales over a wide geographic area. Cheap raw materials and a chronic shortage of skilled labor early encouraged the mechanization of industrial processes in the United States. This, in turn, required the standardization of products and resulted in the volume production of such commodities as firearms, sewing machines, bicycles, and many other items. In 1913, the United States produced some 485,000 of the world total of 606,124 motor vehicles. The Ford Motor Company greatly outpaced its competitors in reconciling state-of-the-art design with moderate price. Cycle and Automobile Trade Journal called the four-cylinder, fifteen-horsepower, $600 Ford Model N (1906-1907) “the very first instance of a low-cost motorcar driven by a gas engine having cylinders enough to give the shaft a turning impulse in each shaft turn which is well built and offered in large numbers.” Deluged with orders, Ford installed improved production equipment and after 1906 was able to make deliveries of a hundred cars a day. Encouraged by the success of the Model N, Henry Ford was determined to build an even better “car for the great multitude.” The four-cylinder, twenty-horsepower Model T, first offered in October 1908, sold for $825. Its two-speed planetary transmission made it easy to drive, and features such as its detachable cylinder head made it easy to repair. Its high chassis was designed to clear the bumps in rural roads. Vanadium steel made the Model T a lighter and tougher car, and new methods of casting parts (especially block casting of the engine) helped keep the price down. Committed to large-volume production of the Model T, Ford innovated modern mass production techniques at his new Highland Park, Michigan, plant, which opened in 1910 (although he did not introduce the moving assembly line until 1913-1914). The Model T runabout sold for $575 in 1912, less than the average annual wage in the United States. By the time the Model T was withdrawn from production in 1927, its price had been reduced to $290 for the coupe, 15 million units had been sold, and mass personal “automobility” had become a reality. Bruno, Leonard. Transportation. In Science and technology firsts. Detroit, Gale, c1997: 499-534. Burness, Tad. Ultimate auto album: an illustrated history of the automobile. Iola, WI, Krause Publications, c2001. 503 p.
Coffey, Frank. America on wheels: the first 100 years: 1896-1996. Los Angeles, General Publishing Group, c1998. 304 p.
Eckermann, Erik. World history of the automobile. Warrendale, PA, Society of Automotive Engineers, c2001. 371 p.
Georgano, G.N., and Thorkil Ry Andersen, editors. The new encyclopedia of motorcars, 1885 to the present. New York, Dutton, 1982. 688 p.
Lafferty, Peter. Top gear: the history of automobiles. New York, F. Watts, c1990. 32 p.
Posted in History and tagged The First American Car Inventor, Who invented the first automobile in the united states?, who set up the first American car manufacturing company?.